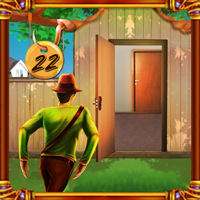 Top10 Doors Escape Level 22 is another point & click escape game developed by Top10NewGames. Assume you are trapped in a house and you try to escape by using a key, objects, hints and by solving puzzles. Can you escape? Good luck and have fun! Bugged, little faces do not move. The game was not bugged for me. The 25-minute walkthrough appears to have been compiled by someone who has never seen a computer game before.